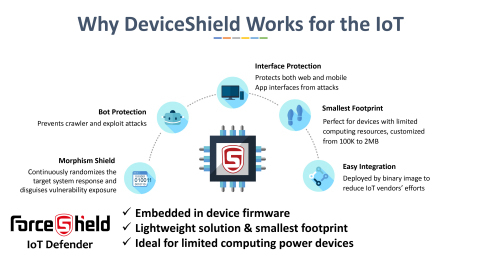 PALO ALTO, Calif. & TAIPEI, Taiwan--(BUSINESS WIRE)--IoT Day—ForceShield, the IoT Defender, today unveiled DeviceShield, a new embedded IoT security solution that prevents automated attacks on IoT devices and stops hackers in their tracks. With the smallest footprint in the industry – customizable from 100k to 2MB – DeviceShield integrates with device firmware to protect against vulnerability and zero-day attacks immediately, without signature updates. DeviceShield is powered by ForceShield’s Dynamic Transformation Technology which randomizes target system response and disguises vulnerability exposure. Unlike signature- or policy-based security solutions, ForceShield’s Dynamic Transformation works proactively to reduce the business impact caused by device vulnerabilities, even in devices with limited computing power. “Traditional reactive security solutions are failing the industry by not being able to respond fast enough to vulnerability threats and automated attacks. That’s why a proactive defense is required to secure the Internet of Things,” said Yu-Min Lin, ForceShield co-founder and CTO. ForceShield is launching DeviceShield on April 9, designated as global IoT Day. At the 2018 RSA Conference in San Francisco, ForceShield will demonstrate DeviceShield and other security solutions based on Dynamic Transformation technology at booth #5104, North Expo Hall, April 16-20.